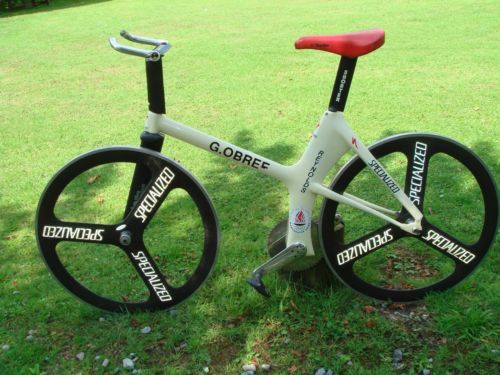 One of the bikes that Graeme Obree “the Flying Scotsman” used in his world hour record bid in 1993 in Hamar, Norway has been sold on eBay for £10,000 by his former manager, Vic Haines. 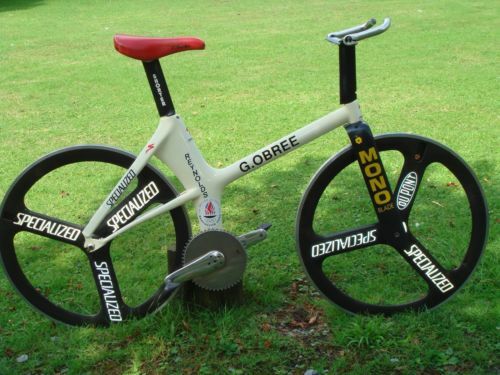 Obree attacked Francesco Moser’s record, on 16 July 1993, at the Vikingskipet velodrome in Norway, using the bike Haines had built for him, a replica of Old Faithful built by London bike shop Shorter Rochford with aerodynamic carbon fairings added by famous engineer and frame designer Mike Burrows. He failed by nearly a kilometer. Obree had booked the track for 24 hours and decided to come back the next day. This time, he’d switched to his own built bike, the famous “Old Faithful“. He set a new record of 51.596 kilometers, beating Moser’s record of 51.151 kilometers by 445 meter. The winning bid came with five seconds to go. It was £10,000.